Hoof boots are the healthy alternative to shoeing as a form of hoof protection. They allow all the benefits of barefoot hoof care, while providing the comfort that encourages the horse to move with the correct heel-first landing. Why Should a Barefoot Horse Need The Protection of Hoof Boots? Much of the inspiration for barefoot hoof care comes from horses living in their wild state. The health, durability and toughness of their hooves is something to behold. For this reason, the ideal of the ‘rock-crunching’ barefoot domestic horse, that can conquer any terrain with his rider aboard, is widespread in the world of barefoot. 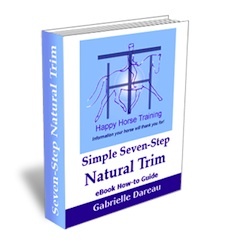 There is, of course, so much we can learn from the horse’s natural wild state, and apply to our own domestic horses – the Seven-Step Natural Trim is a testament to that. But we have to be equally aware of the differences between domestic and wild horses, and how we need to address them, not only for the comfort of our horses, but in order to promote the greatest possible health of their hooves. The fact is that the lifestyle of the domestic horse, by definition, differs enormously from that of the wild horse, and this has a significant impact on the strength of the internal structures of the hoof. We only need to look at cross-sections of hooves that compare the two to see the proof of this (see hoof cross-section photos on The Importance of Natural Horse Hoof Care). This difference is why the protection of boots is so important to good barefoot hoof care. The wild horse moves almost continuously from the moment it is born, reportedly covering an average of 26 miles every day. This stimulates and builds the strength of the internal structures of the hoof such as the digital cushion, in addition to maintaining the wear of the hoof wall so that it does not become overgrown, distorting the hoof form and balance. The wild horse diet is much lower in sugars than the average domestic horse diet. The horse, as a species, is not evolved to metabolize these sugars correctly, and their by-products are toxic to the feet (see: The Horse Diet and its Importance in Hoof Care). Even if a domestic horse has been converted to barefoot, many were previously shod, and have profound long-term damage to, and weakness of the internal structures of the hoof. The genetic factor: healthy hooves have been a crucial part of the wild horse’s evolution over millennia. However, the selective breeding that has resulted in the domestic horse, in its many forms, has seldom taken into account good hoof make-up. For centuries the weaknesses of the domestic horse hoof have been covered up by the practice of shoeing, and it is difficult to ascertain the extent of the genetic factor, but you only need to compare the average modern native horse breed hoof with that of the thoroughbred or warmblood to see that there is indeed a genetic influence. 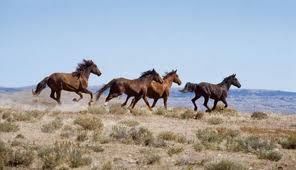 Although there is much we can do to lessen these differences between the wild and domestic horse lifestyle (e.g. by addressing the diet, and using management solutions such as Paddock Paradise), the fact remains that domestic horse hooves, in most cases, are far from having the internal strength of wild horses hooves. 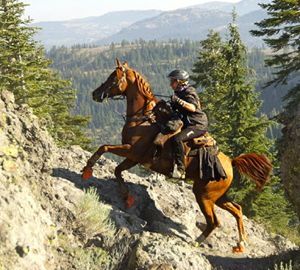 In addition to this, the domestic horse is expected to carry the weight of a rider, and to go where that rider says, no matter what the terrain. Hoof boots are a practical way that we can compensate for these differences, and give the domestic horse the comfort in his feet that he deserves. For the reasons described above, we have a duty to provide some form of extra protection for the hoof when the horse is being ridden. We can now do this relatively easily by using the hoof boot, which is becoming more and more popular as an alternative to shoeing. Of course, the great advantage of these boots is that they are removed when the horse is not being ridden (except in some remedial cases) and the hoof is returned to its natural barefoot state the rest of the time. Hoof boots are now recognized as a must by most Barefoot Practitioners for horses making the transition to barefoot after shoeing. However, many still hold fast to the ideal of the horse returning to being fully barefoot after this transitional period. The problem is that this opinion often does not take into account the effect that even a slight degree of discomfort and/or weakness of the hoof has on the horse’s movement. 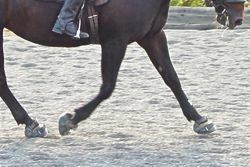 A horse who has even a low degree of discomfort in the hooves will compensate for this by landing, every stride, on the toe first, as opposed to the heel. This is because the main nerve clusters of the hoof are situated underneath the frog, so a horse with sensitivity avoids taking the impact of landing on the heel by pointing the toe to the ground. Not only does this deform the natural, supple movement of the horse, putting strain on the joints, tendons and ligaments, and concussing the pedal bone, it also starts a negative cycle in the hoof itself. This is because the stimulation of the healthy heel-first landing every stride helps to develop and strengthen the structures within the hoof, such as the digital cushion, and it also gives important nervous feedback to the horse’s nervous system. Even on a soft surface, horses often show a better heel-first landing with the protection of boots than without. 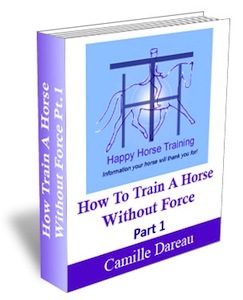 Perhaps this is due to the strong associative and anticipatory of the equine mind – if they know that the protection of the boot is there, they will relax more readily into a heel-first way of going, no matter what the surface. The first photo above (left) shows a beautiful heel-first landing, both in front and behind, with the protection of Renegade® hoof boots. The second (right) is the same horse some years earlier - barefoot, but without the protection of boots, landing on the toe of the hoof in order to protect the more sensitive heel from the impact. 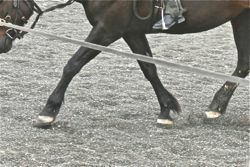 Note how the whole extension of the limb is affected by the toe-first landing, fundamentally altering the natural, supple movement the horse has when the feet are comfortable. 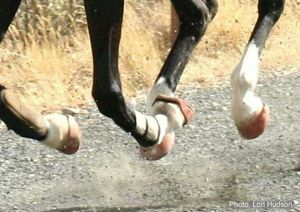 Some riders are reluctant to consider hoof boots instead of shoes due to the uncertainty of using them in competition. In fact, the rules are starting to change in many equestrian disciplines where there has previously been considerable discrimination against the use of boots. Already in Endurance competition, hoof boots are becoming more and more popular – several of the top riders in the US use Renegade® boots, which are available in a glue-on version specifically designed for the most demanding endurance rides. The boots not only provide all the advantages for the hoof, they also assist the cardiac performance: an unshod horse’s blood circulation is significantly aided by the pumping action of the healthy hoof, lessening strain on the heart and resulting in a lower heart rate result at the vetting. Let’s hope that the other disciplines catch up soon, and hoof boots start to become more accepted in competition. The more demand there is for change from horse owners, the quicker this will happen. With the increasing popularity of hoof boots, there is an ever-growing range of different types to choose from. You may need to do some research to find which suits your particular use the best. Due to their unique design, they are significantly more flexible than any other hoof boot available, allowing the natural movement of the hoof structures, and providing the best comfort for the horse. They are neat and close fitting unlike many cumbersome varieties of hoof boot, and their fit corresponds perfectly to the Seven-Step Natural Trim. They don’t come above the coronet band, eliminating the problem of rubbing. They are easy and practical to put on and take off. They are available in a glue-on version, which is the only really viable all-round alternative to shoes in competition. They are available with studs for extra grip on slippery surfaces and for jumping. They are tough and durable despite being lightweight and flexible. All parts of the boots are replaceable. Renegade® hoof boots were designed by someone who put the horse first, and this is what we have to keep in mind with barefoot too – it is not about a moral crusade to prove that horses don’t need shoes, it’s about doing what is best for the horse, and hoof boots are clearly an important part of that. Hoof boots need to be well fitted in order to avoid the risk of them coming off when you are riding. However, even if this does happen, it is still usually a lot easier to get off and put the boot back on, than to deal with a lost shoe. There is an ever-increasing choice of boots available, and if you find the right boot for your equestrian activity, you shouldn't have a problem with hoof boots slipping or coming off in any conditions. For performance riding, using glue-on boots completely resolves this problem. Depending on the type of boots you are using, the ground conditions, and the mileage you cover in them, hoof boots may wear quicker than shoes. 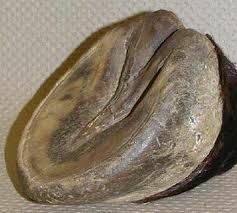 However, most hoof boots are surprisingly tough and long-lasting. In comparison, shoes will always have the disadvantage that they must be removed and re-fitted by the farrier about every 6 weeks to allow for trimming, even if they don't wear out this quickly. Most hoof boots under normal conditions will last many times that time-period. Most hoof boots have replaceable parts to maximize their longevity. Rubbing of the skin above the hoof can be an issue with boots that come up above the hairline, especially for fine-skinned horses, and if grit gets caught inside the boot. Renegade boots do not come up above the coronet, and the flexibility of the padded heel encapsulator avoids any rubbing of the heels. Hoof boots may seem like an expensive outlay initially, but in fact, compared to the cost of shoeing, they very quickly pay for themselves. Perhaps one of the most discouraging factors to horse-owners regarding hoof boots is the lack of convenience of having to put them on and take them off every time they ride. It can't be denied that in this way shoes are more convenient. In addition, it may well seem like the easy option to completely hand over the responsibility for your horse's feet to a farrier. However, the flip-side to this is that you in a position of dependance, and the inconvenience involved when your horse loses a shoe and the farrier can't come out, or even in making sure the farrier comes regularly enough, is significant. Using hoof boots when you ride is something you quickly get used to - it soon becomes just another part of tacking-up. The little extra time this takes is a small price to pay for the immense benefits for the health, soundness, and comfort of your horse. A testament to the possibilities of the hoof boot in high-performance riding. See the Renegade® homepage for the story of this winning combination. Return from Hoof Boots: A Revolution In Horse Hoof Protection to HHT home.